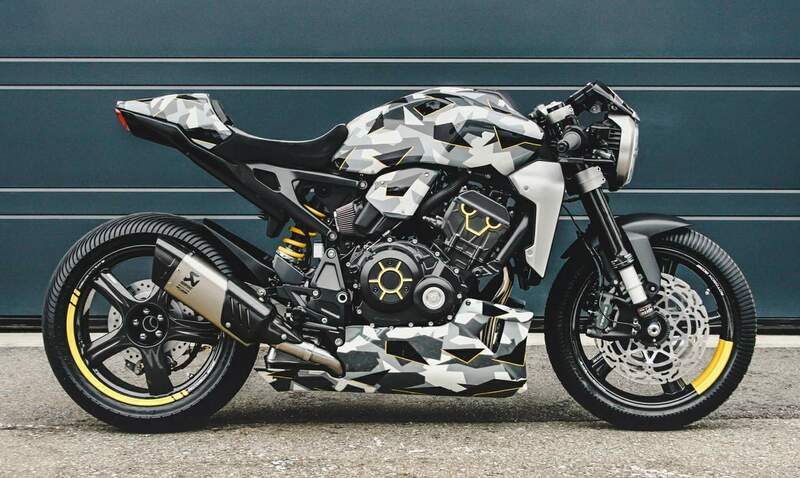 This custom conversion of a CB1000R into a camouflage bullet – R-adical, is the winner of the Custom CB1000R competition held by Honda Switzerland and was presented at the Swiss Moto show in Zurich in February 2019. 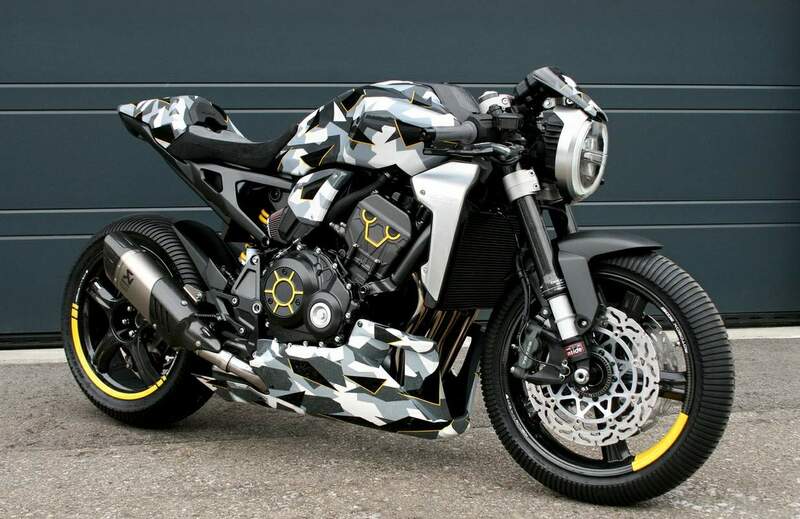 The bike was designed by Ulfert Janssen of Gannet Design and built by Stefan Fuhrer, the former MotoGP racing mechanic and his crew at Fuhrer Moto. Our aim was to produce a completely new appearance mainly by changing the proportions and handlebar position, while leaving the basic components untouched to show the extensive possibilities for this model’s customization. 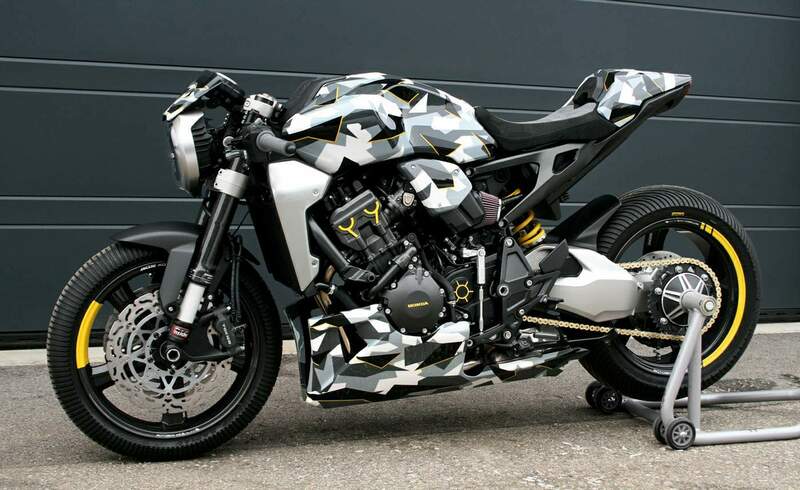 The contemporary camouflage graphics on the tank and the paneling was created by precise painting work and was gradually built up in 7 layers. Through the special collaboration with 422 Corse, this bike has been fitted with high-performance carbon fiber rims from Rotobox, as well as a carbon fork from CeraCarbon. 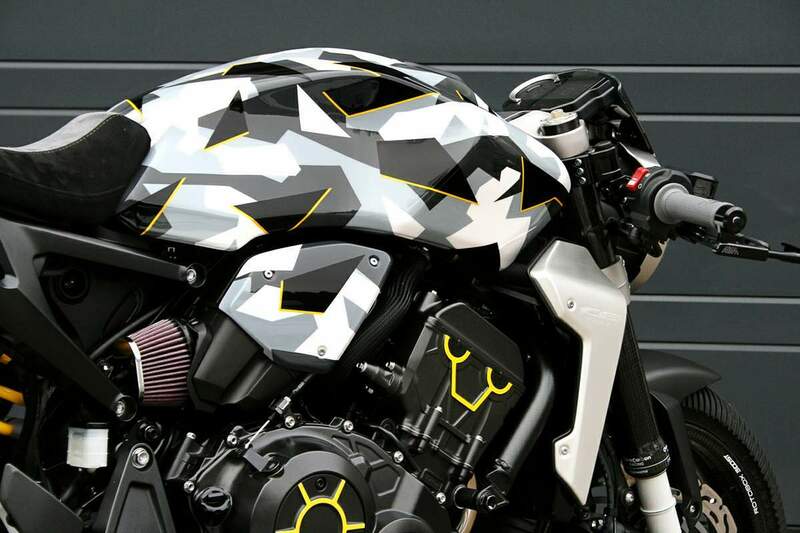 The altered proportions, along with the modern graphics and ultra high-tech carbon parts, give this Honda R-adical an incomparably aggressive fast forward attitude. Ulfert Janssen: "Many people underestimate the importance of balance and proportion in a custom build. 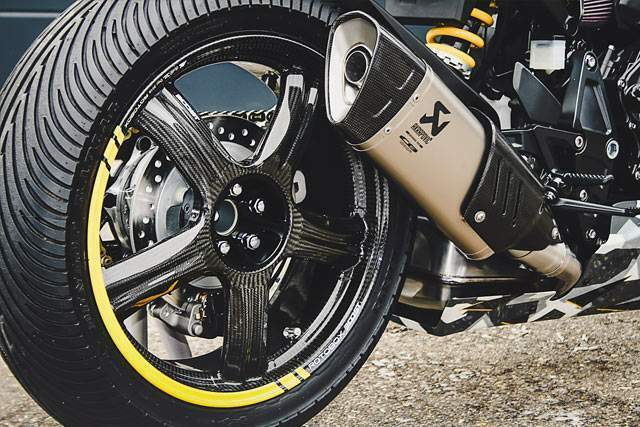 Just by changing the stance, angles and position slightly, you get an entire new perception and attitude of a bike." Ulfert: "By using paint layers, we could control each single element and place it without any deformation you would get by using foil. Therefore the result is very precise and you can clearly see the impeccable paint job by Walter." Stefan Fuhrer: "The front is incredibly beautiful and hot. Through CNC milling, we have created a new fixation design for the front light and the mini windshield. With the new three-piece CNC mechanism, we can now change the height of the headlight and adjust the windscreen to any angle. The front headlight has been moved forward by 60mm and slightly lowered. 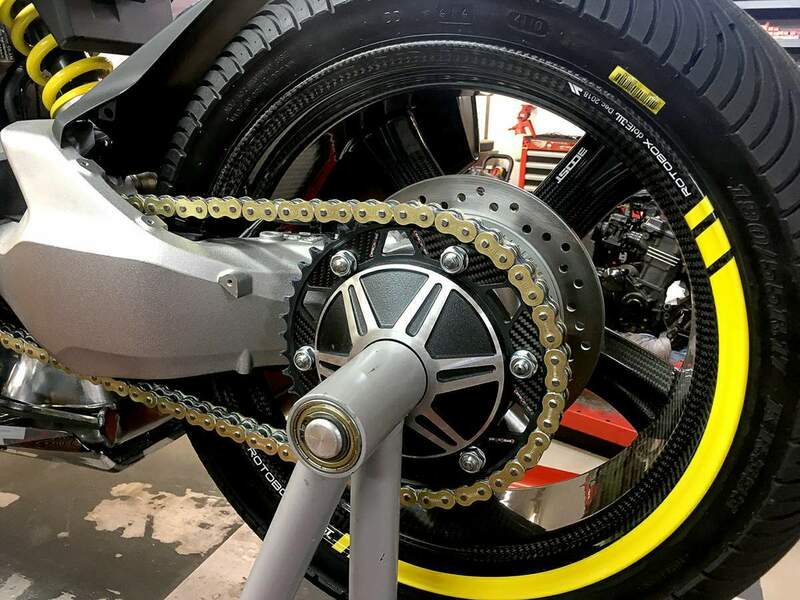 This new special fixation together with the Multiclip, the triple clamp, and the carbon fork give this bike a very technical and cool visual impression like in a Transformer movie." 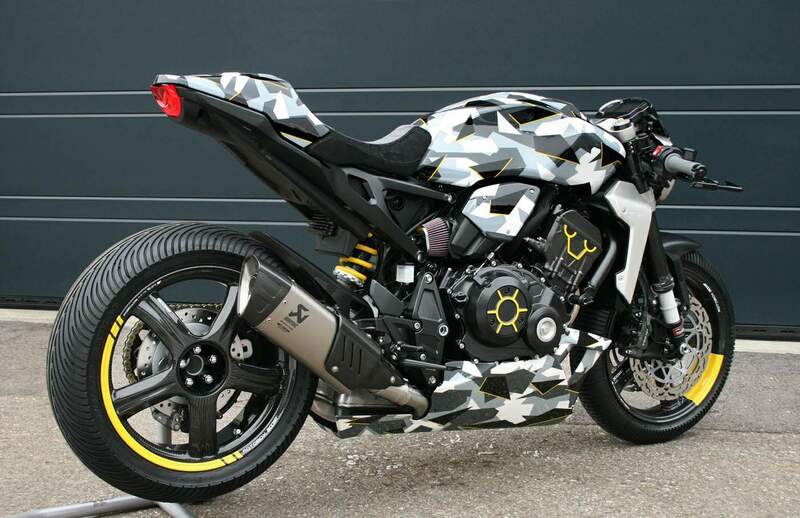 Stefan: " I found this work on the CB1000R extremely exciting and inspiring. When I think back it is almost like a poem, or a story. I spent evenings and nights screwing together parts to take them apart again because it was somehow not consistent yet. It is a gradual building process to get the right coherence of the bike. At the end you can clearly identify the original Honda CB1000R donor bike, but yet the impression of our custom build is totally new."